This article is about an extinct whale. For other uses, see Denebola (disambiguation). Denebola brachycephala is an extinct whale belonging to the family Monodontidae. 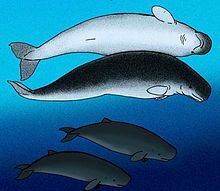 It is the earliest known ancestor of the beluga, Delphinapterus leucas, and dates from the Upper Miocene period. A fossil was found in the Baja California peninsula, indicating that the family once existed in warmer waters. ^ Barnes, Lawrence G. (1984). "Fossil odontocetes (Mammalia: Cetacea) from the Almejas Formation, Isla Cedros, Mexico". PaleoBios. 42: 13–17. ^ ZipcodeZoo.com. "Denebola brachycephala". Archived from the original on 2012-08-20. Retrieved 2010-09-16. ^ William F. Perrin; Bernd G. Würsig; J. G. M. Thewissen (2009). Encyclopedia of marine mammals (2 ed.). Acadenmic Press. p. 214. ISBN 978-0-12-373553-9. This page was last edited on 21 March 2018, at 13:18 (UTC).